We, Pi Water Torrance sell Pi Water Products (Water Processor for entire house, for kitchen counter top type & under the sink type, filter for shower & bathtubs).Also we sell water softer, water conditioner (E-Treat) and Thankless Water Heater. We sell water system for restaurant for various sizes. 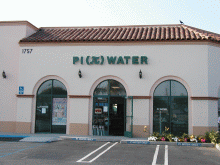 Please register your Pi Water products in our store when you purchase of Pi　π(pai) water products at Pi Water Torrance. We offer the privilege when you purchase within one month of the date of the filter expiration, you could get a 10% discount on a replacement filter.